What are the chances that a B-side – something cut in the same vein no less as the underwhelming top side – is going to resuscitate the image of the artist in question? Well, before you get your hopes up that holds true here as well, as rock’s first great producer and one of the more talented saxophonists of its first half decade comes up short on his own initial efforts to make headway as an artist under his own name. But far from being unimportant in trying to recreate rock ‘n’ roll’s evolution, what this shows better than even some of the biggest hits is just how difficult this supposedly uncouth music was to get right. One of the things we’re always worried about when it comes to accomplished older musicians getting into rock ‘n’ roll is their commitment to this so-called low-brow noise. 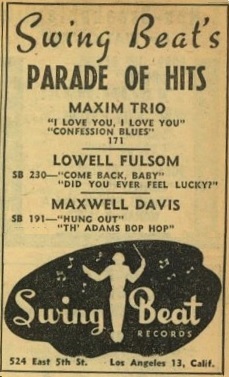 But Maxwell Davis had shown when helming the sessions for Amos Milburn that he was by no means a musical snob who looked down on all of this commotion. Though now thirty-three years old and someone who had first drawn notice as a musician playing behind Fletcher Henderson years earlier he’d made the switch willingly – even enthusiastically – to rock ‘n’ roll when he began working behind the scenes as an A&R man for a myriad of West Coast independent labels in the post-war years. His efforts to date – both hits and misses alike – have left no doubt that he was fully invested artistically in rock every bit as much as he’d have been for something more high class such as jazz. Subjecting yourself to the needs of a company paying you to work behind others is one thing, that could be merely a sign of professionalism, so the next concern is what would happen if they themselves became the credited artist rather than a supporting player behind somebody else… when it was THEIR reputation on the line. Would they hedge their bets, reverting back to something they perhaps felt more comfortable in, or felt was simply “better” music. Would they want to show everybody that there was more to them than simply chasing the increasingly lucrative rock dollar? Thankfully the answer to that – at least so far – was no. Davis remained squarely situated in rock ‘n’ roll, at least when it came to his own playing on his records. Granted he wasn’t going to go wild like some of his competitors, honking up a storm and risk having his lungs implode, but he wasn’t going to play any whimsical flights of fancy either. So where does that leave us? Why would somebody who’s shown that he fully grasps the intricacies of rock arranging and understood how important it was not to loosen the grip on the listener who expected something bristling with energy, fail to deliver that on either side of his first single in this field on his own? That’s the question we’re still asking, seventy years down the road. I don’t know who Adams is, but the title of this doesn’t do Davis much good any way you look at it, be it at the time it came out or in the years since. For starters the label scan I have doesn’t have Adams in the title at all, leading me to think initially that it was some later compiler who inadvertently added it screwing things up for historical purposes. But then looking at the trade ads at the time you can see that it WAS promoted as Th’ Adams Bop Hop so who knows what to think. But there’s no Adams on this, not among the musicians – Williard McDaniel, piano, Ralph Hamilton on bass, Jesse Sailes on drums, Herman “Tiny” Mitchell the guitarist, along with Davis’s sax. Furthermore Davis gets sole writing credit and even the label, the newly named Swing Beat (after Downbeat magazine complained that the original label name was hurting their business) was owned by Jack Lauderdale, not some guy named Adams. Oh well, whoever he is he might not be so keen to have his name attached to this song anyway if he was trying to get some street cred as a rock impresario as once again we’re faced with something that may fit the frame all right but doesn’t draw your attention when it’s hanging on the wall. Maybe that’s a little harsh, for this is slightly better than the A-side, Hung Out, if only due to what it sheds, or at least scales back on, but the songs are truly the definition of “two sides of the same coin” when it comes to what they’re trying to do – provide a moderate rock experience without attempting to redefine it in the process and for somebody as visionary as Maxwell Davis was that in of itself was a let-down. On both sides of the record the approach is similar – a medium tempo groove featuring solid, if unspectacular, tenor sax work… not too heavy, not too light. Call it “appropriate” honking and leave it at that. Davis can certainly play, there’s no losing his way on this, no moments where he lets up too much and sees the notes float into the ether, but there’s also no real aggression in his playing, no urgent force being exerted. Like a car with cruise control he’s moving along at a steady clip, not holding up traffic behind him, but he’s not passing anybody in the fast lane either. He’s just keeping the car pointed in the right direction in the middle lane and riding comfortably along. On the highway you kind of like being behind somebody like that, if only because it makes for a stress free trip as there’s no zig-zagging in and out of traffic, nobody cutting in front of you or riding your bumper hoping you’ll speed up, but in rock ‘n’ roll it’s the reckless drivers who draw in listeners because as a spectator sport it’s much more fun seeing the cars pinball off one another and leave a trail of wrecked cars in their wake. Where Th’ Bop Hop pulls away, ever so slightly, from the top side is in its editing. I don’t mean the recording itself was edited down from a longer cut, but rather the arrangement was condensed. The track is twenty-five seconds shorter and what gets excised here is what did in the chances for Hung Out, namely the extended solos for piano and guitar. Both of those instruments DO get a showcase here, but they’re far shorter and slightly more assertive in their presentation. McDaniel’s work in particular is improved smply because he’s using his left hand more, giving what he plays more gravity. It’s still nothing to write home about, and truthfully if it had been excised altogether the track might be all the better for its absence, but at least it’s not sending you scurrying for the exits as his work on the other side threatened to do the longer it went on. Tiny Mitchell’s work on guitar which precedes it falls into the same trap as it did on Hung Out however, its discreet jazz tones sticking out like a sore thumb amidst the more fervent blowing by Davis. If you want to fault Maxwell for something here it’s definitely his generosity in giving these two more of a spotlight than either one earns with their playing. Both are good musicians who are in need of a refresher course for the right way to arouse the rock crowd but being a producer as well as the bandleader on this, Davis should’ve been far more assertive in getting them to fall in line with what he’s up to on his sax. Which brings us back to Davis who gets more time at the center of the stage to leave a good impression. He hadn’t quite taken advantage of that on the other side, though didn’t let you down too much in the process, but here he steps up his game just enough to meet our needs and he works well in tandem with Jesse Sailes on drums to bolster the track and leave behind any thoughts that he was just going through the motions. His primary riffs are pretty basic, a decent melody played with a full-bodied texture to keep you satisfied. His first solo is his best and not surprisingly the closest he gets to actual honking and Sailes is providing good support answering him. He quickly backs off though and by his next solo he’s taking it a little easier at first before ramping things up again by the end. But by this point you’re fully aware he’s not going to really cut loose and so you better be happy with what you’re getting because he won’t be giving you anything to make your head spin. Was that right move to make? We’ve seen a lot of sax players have absolutely no idea of how to build up to an explosion, then once the first bang comes there’s just a lot of smoke and no real concussive effect and certainly no sense of how to tie any of it in to a melodic structure. Davis doesn’t make that mistake at all. Th’ Bop Hop has a very organized sense to it all, there’s no aimless wandering that beset so many other records by lesser acts, he’s got a well conceived plan and he sticks to it, all of which shows his skill as an arranger. But on the other hand there’s also no sense of excitement, no risky thrill in seeing somebody take off on a run that may or may not have a way to descend back into the atmosphere safely and its absence leaves you feeling just a little let down. Maybe this was Maxwell Davis’s professionalism at work. The reasoned judgment that ensured all of his productions for others were going to be of a certain standard also meant that he wouldn’t be taking unnecessary risks just to come up with a record that was so hot it melted the stylus when it played. The question asked earlier about why he wouldn’t go all-out in an attempt to make a name for himself as a performer has a reasonable answer found embedded in the preceding paragraph, namely that he WAS a professional, someone who knew that a hit record on your own was a temporary boost to your career, whereas being reliable in the studio no matter what genre you were tasked with playing or producing was something that carried better long-term prospects. The more he tried to be defined by one record the more he’d be resigned to recreating that record over and over in the hopes of matching it commercially. Ask Hal Singer his thoughts on that predicament after hitting with Cornbread which left him no alternative but to ride the honking rock train until it derailed and he could make a getaway on an ocean liner or airplane across the ocean and immerse himself in the European jazz scene. Davis never had to worry about being identified too closely with anything. He’d shown he could play rock with the best of them, but he did so far more freely when it was somebody else’s name getting the credit. By taking this more modest approach on his own sides while focusing more on his work behind the scenes for others he was able to indulge in all sorts of styles that he might otherwise never have gotten the chance to explore. Record companies knew that he could shift to jazz or pop, blues or rock behind whomever he was assigned to work with and that he wasn’t going to merely “rock up” everything he laid a hand on. Though that malleability did him well in his career it ultimately harmed him somewhat in his legacy. Because he never stood out, never TRIED to stand out for that matter, he became easy to take for granted if not overlook entirely. In a way you’d have liked Davis to have really taken a chance on a record like Th’ Bop Hop and added some more muscle to it and make a statement that he could hang with whatever rowdy horn maniacs were setting the pace in rock at the moment. There’s no question he could’ve, both in terms of his ability and in terms of the existing arrangement which only needed to be tweaked slightly to get it in the fast lane. But had he done so he wouldn’t have been Maxwell Davis anymore, at least not the Davis we’ve come to know, respect and even love when adding his understated touch to the work of Milburn and others still to come. Sometimes the mark of true greatness is being willing and able to take a back seat to others because your skill set are attributes most suited for a supporting role. That won’t get the headlines and sadly it won’t make you immortal, but those who benefited from his willingness to subject himself to their artistry became bigger stars as a result of his decision to do so and that might stand as the most fitting testament to his greatness. 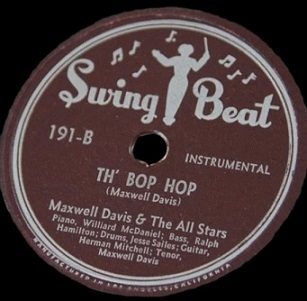 Leave a reply on "Maxwell Davis: “Th’ Bop Hop”"